The entirely CGI-animated Resident Evil: Degeneration was, for my tastes, far better than the live-action Resident Evil. Admittedly, I have only seen the first RE movie – I was so disappointed I didn’t bother with the others, though I will eventually. In Resident Evil: Degeneration you have a typically (for the franchise) convoluted plot that centers around the efforts of another company to pick up the pieces of the Umbrella Corporation’s research and profit from it, even if that means their market is terrorists. 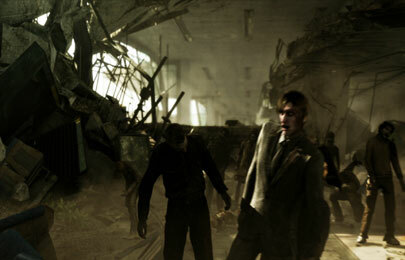 The main event is a release of the zombie-making T-virus in an airport and pure zombie mayhem is the result. Franchise heavyweights Leon Kennedy and Claire Redfield are the main characters and they lead a rescue mission from inside the airport, before tangling with a corrupt corporate executive (is there any other kind?) who’s concocted an elaborate plot to test the G-virus, which creates a weird reptile/insectoid hybrid demonic-looking mutant that is all but unkillable. There’s also a romance sub-plot between Kennedy and a new character, and the new character’s brother is involved in the release of the G-Virus, as revenge. Oh, and he is being manipulated by the corporate executive who’s linked to the senator trapped in the airport and, uh, … did I mention it gets a little convoluted? The movie looks great at times and horrible at others, depending on what the scene portrays.Â The zombies themsleves and the action scenes typically look great, and the fires looked nothing short of amazing (the film makers knew this, and used the effect as much as possible). Unfortunately, any kind ofÂ emotional scene or anything that required a facial close-up was way too much “Welcome to Uncanny Valley!” to be anything but off putting. The pacing is generally tight but it does drag at moments and the story is convoluted enough to be difficult to follow at times. Those two things conspired to make my attention wander at several points. Luckily the dialog is nowhere near as bad as the games’ famously bad writing — at its worse, it’s just kind of stiff and unrealistic, but no worse than many a live-action zombie epic I’ve sat through. For fans of the RE games, this is definitely a worthy exercise, if only for the additional insight into the characters and back story of the games.Â For fans of the RE live action movies it’s probably little more than a curiosity at best and utterly confusing at worst (“Uh, how does this relate to Alice now?”). For general zombiephiles, it’s an interesting, if flawed, work that’s worth a look (especially if you enjoy anime, which it strongly resembles in many ways: pacing, story and dialog in particular).